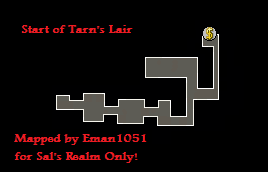 Enter the starting portion of Tarn's lair. 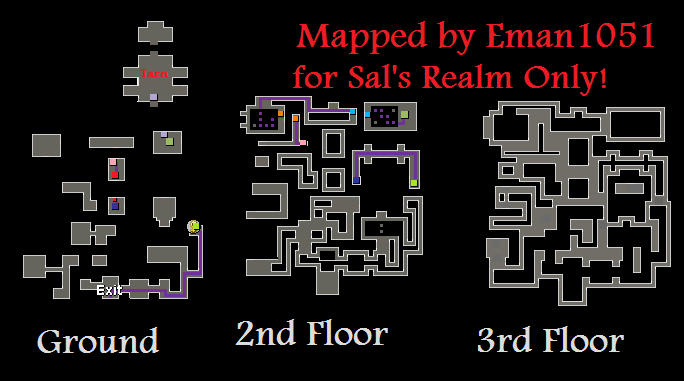 Note: Those who own a Ring of Slayer can just teleport to the room before Tarn, thus skipping the maze. 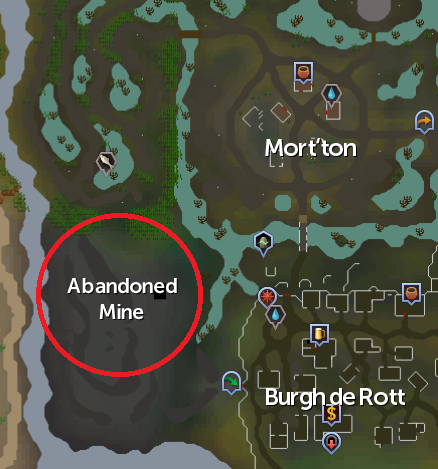 Start by making your way through Mort Myre Swamp down to the abandoned mine. 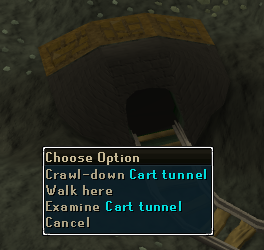 Once there, climb over the mine cart and crawl-down the cart tunnel. Once inside head to the room to the north with the green stones. Enter the entrance and you are in the beginning portion of Tarn's lair. Keep heading east, watching for floor traps, coming up in a near by room there is a new trap. The walls are now traps. 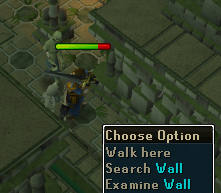 The walls are always two traps next to each other and you need to disarm the first one to walk past both of them. 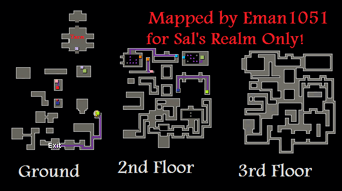 Keep heading east, while still disarming traps that you encounter, until you come up to the long hallway going north. On the wall going north there is a wall trap, disarm it and you don't have to worry about monsters attacking you anymore. 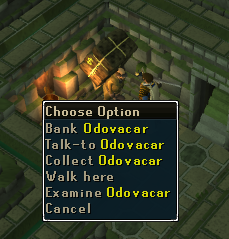 Keep walking up the hallway disarming all traps until you reach the room with Odovacar. He will allow you to bank for 100 gp every time you need to enter your bank. This is the perfect time to restock on food and prayer potions for this is the only time you can restock through the dungeon. When you are done banking enter the passageway. Once you enter the passage way you will be a room that curves. Run all the way to the western side of the room and go through the south-western most door. Be aware that there are still traps all over the floor. Once you go through the south-western most door you will be in a room with an aggressive Giant Skeleton. 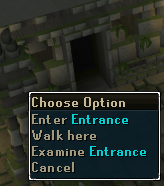 There are no traps so go through the northern door. In that room go through the western door. Once through, make your way to the next hallway going north. There are two wall traps in the hallway disarm them and go through the door to the west. You are now in a room with pillars and a log trap. To get to the northern side of the room you must disarm the the log trap. 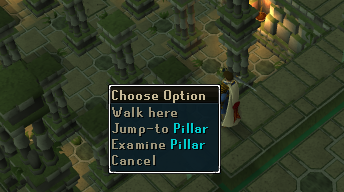 Head to the western side of the room by right clicking the pillars and selecting jump-to. Once you reach the western side of the room go to one of the little spaces and search the floor. It will say you hear a click. 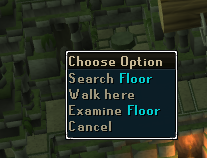 Now jump from pillar to pillar to get to the northern side of the room. Now that you're on the northern side of the room head east down the hallway. Disarming any wall traps you see. After a while of walking down you will see two wall pushes. If you stand in front of them when they push out you will be knocked to the floor below. To get past these get as close as you possibly can without stepping front of it, and when it goes in run in between the two. Wait for the other one to come in and run across that one. Do not try to run past both of them while there in or you will fail. After you pass those two there will be another set a few steps ahead. 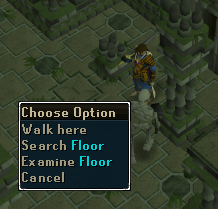 In the next room there are more pillars you need to jump across, except this time there is no trap you need to disarm. The only thing is there are level 79 skeleton mages that will cast magic spells on you. You can either have protect from magic on or wear dragonhide armour to reduce damage. Once across go down there stairs. This is the last room you have before you face Tarn. This room has no traps. When you are ready to fight two level 79 versions of Tarn go through the north door. Once you go through the north door you will enter a cut scene of Tarn. During the cut scene he will turn into a level 79 green giant. He will summon two level 65 terror dogs and level 39 suits of armor. You only have to worry about killing Tarn. 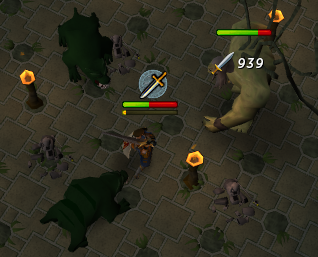 The best way to kill him is by using protect from melee and trapping the large terror dogs behind the torches. Prayer potions or super restores are recommended since your prayer is drained rapidly. After the first form of Tarn is defeated he will come back as a level 69 ghost form. After the two forms of Tarn are defeated a door to the north will appear. 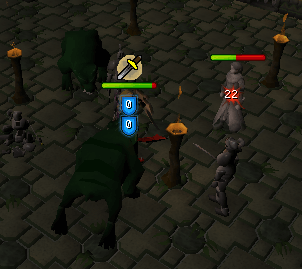 Also after they are both defeated you will gain 5k Slayer Experience. Go inside the north door. Once inside go to the table and grab Tarn's diary. Now for your real reward, use Tarn's diary on your Salve Amulet. You will now have a Salve Amulet (e). The Salve Amulet (e) will give you 20% damage and accuracy while fighting the undead. 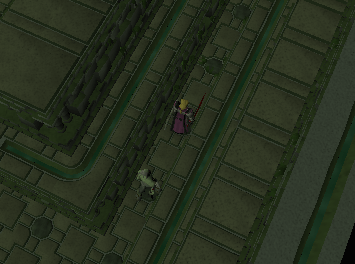 Tarn's Diary - If you ever lose it, you can get another from the bookshelf in your Player Owned House Salve Amulet (e) 5,000 Slayer experience Ability to go to Tarn's chamber to kill Terror Dogs (level 61 and 65).